This chapter introduces the concept of Beacon Architecture as a formalized and ordered grouping of architectural elements, describing the constituents, their order, correlation and likely evolution of the grouping; and illustrating its specific value to the public sector. The first half of the chapter builds up to the concept, the reasons behind its specific nature, and its value to enterprises, especially in the public sector. For this, the chapter is split into a number of sections that may be studied separately and that also build up to introduce Beacon Architecture. The sections may be broadly divided as concepts, historical overview, illustrative case studies in public sector transformations along with a summary of peculiar architectural challenges they face, and a cyclical pattern to Architecture Development. After introducing and elucidating on concept and constituents of Beacon Architecture, the chapter delves into its correlation with architecture concepts in currency and its role in mitigating enterprise architecture challenges illustrated earlier in the chapter, before concluding on an assessment of future trends. Whereas the concept of Beacon Architecture discussed here is an invention in so far as the term, its precise definition/usage and its organization into ordered constituents go, the underlying idea in generic terms is far from novel. Reference architectures have existed in practically all successful architecture governance regimes and transformations, and in a good many of unsuccessful ones too. The precise connotation, well-defined & ordered constituents and specific relationship with architectural concepts such as Vision, Roadmap, Baseline & Target Architectures that underpin Beacon Architecture, are however not a predictable hallmark of such reference architectures. 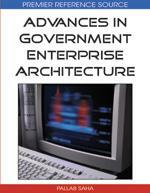 In this chapter, we shall start with aspects that define Enterprise Architecture as a living thing, deliberate on architecture transformation and its journey through the architecture development cycle, meander through evolution of EA frameworks (most of which have had a public-sector pedigree), discuss in some depth Enterprise Architecture challenges peculiar to the public sector, before delving into the concept of Beacon Architecture, its correlation with various architecture transformation concepts, its value to significant architecture transformations and, in particular, its significance to definition, governance and transformation of Enterprise Architecture in the Public Sector. • The second section titled Evolution of Enterprise Architecture Concepts – An Overview provides a brief journey through how Enterprise Architecture concepts have developed and how sectors/industries have contributed to this. This also sets background to what is and is not covered in present day popular EA frameworks, giving context to concepts introduced under Beacon Architecture. These sections provide the right background to understand why constituents grouped under the concept of Beacon Architecture are important and are sequenced as they have been. The Author, in his role as Architecture Authority / Strategist has formalized and successfully introduced in the industry these constituents. The chapter then puts these constituents together in a logical order and highlights relevance of such effort to the Public Sector. The chapter ends with a pragmatic assessment of the likely resistance to establishing Beacon Architecture and the likely scenarios of its institutionalization over the next few years. The immediate, implicit, and, to many of us obvious, logical progression from this is that Enterprise Architecture, which needs context of an enterprise, can only be as defined, robust, coherent and serviceable, as the enterprise itself is. Turning the statement on its head, an enterprise can be explored for its definition, robustness, coherence and serviceability, while exploring/defining its Enterprise Architecture.